We’ve asked this question before – how far would you drive for really good beer? In the case of St. Louis beer lovers, we hope at least 1 hour and 48 minutes. That’s about how long it will take you to drive from the STL to Rolla, Missouri or if you need to shave some minutes, 1 hour and 29 minutes to St. James, Missouri where you’ll find some REALLY good beer. In 2010, Josh & Beth Stacy and Josh & Trisha Goodridge–longtime friends–opened Rolla’s first brewpub. But it was a long, long time in the works. Like any business, there were big ups and downs on the road to the first pour. The “Josh’s” have known each other since junior high and after creating a lifetime of memories the two found another bond in beer. What started out as a hobby, soon became a dream for both. Rolla needed fresh craft beer and they were just the guys for the job. 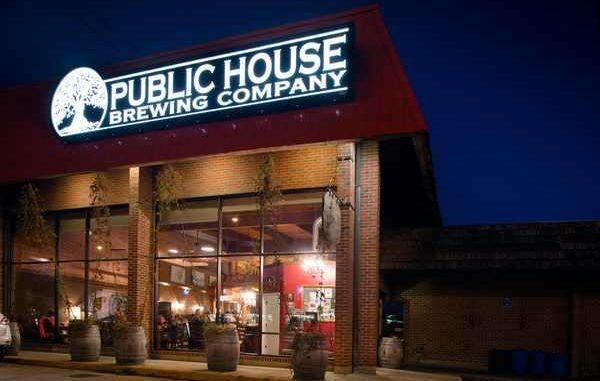 Now, just over 8 years later, no matter which town you pick, you’ll find a Public House Brewery ready to serve you. But, what can we expect in the new year of beer? We reached out to owner Josh Goodridge to find out what he has planned for 2019. We’ve been actively ramping up our R&D side in the Rolla brewpub over the last year and that will continue in 2019. We’re brewing more new and experimental beers all the time and that’s going to create more diversity in our beer lineup overall. I think we’re best known for really consistent, true-to-style, sessionable beers, but we’ve really begun to branch out in new and interesting directions and I only see that continuing this year. We have finally nitrogenized our most awarded beer—Revelation Stout—and it’s absolutely delightful. It is now a year-round option available statewide in Missouri (draft only). We’ve had it on tap in our taprooms for a while now and people loved it so we decided to release it to a wider audience. We also plan to release NITRO versions of some of our seasonal beers starting with Flynn’s Irish Red (draft only). This will hit the market in February. Many of our beers lend themselves to nitro so it just made sense to have a little fun with some of our favorite beers. We’re working on more barrel-aged releases of Revelation Stout and Anthony’s Pacification Russian Imperial Stout for draft and possibly 750ml bottles. We’re even barrel-aging Flynn’s Irish Red right now in Stonebreaker Whiskey barrels from Restless Spirits Distillery in KC. That should hit the market in February as well. As of this moment, we are planning to release 8-10 new beers this year in various formats—although the list of new beers in planning seems to grow by the day. We just released our first variant on our popular “Giddy Goat Coffee Milk Stout.” It’s called “Cabra Loca Espresso Milk Stout.” We took the base beer for Giddy and made it a little bigger (from 5.5% ABV to 7.0%ABV), then layered in cinnamon, cocoa, and cayenne. It’s a bit of a take on the Mexican hot chocolate beers we’ve seen popping up over the last couple of years. We used “Rockabilly” espresso beans from Giddy Goat Coffee House in Rolla, MO, instead of the Papua New Guinea beans that are in Giddy Goat. I think what makes it all come together is the specific use of cayenne. A lot of pepper beers tend to lean towards the smoky side and can be a bit overpowering, but cayenne provides a pleasant, even heat. It’s available on draft in Missouri and it will be the exclusive beer in our Taproom Sampler 12 pack that is in stores during the first quarter. Other planned beers in no particular order (since the calendar is still being finalized) include a Watermelon Kolsch, a rye honey pale ale, and a schwarzbier. We’re also working on a new IPA that I’m very excited about but it’s still in development. More to come on that later. We are currently scheduled for a collab brew day with our good buddies from Logboat Brewing in Columbia. They’ll be brewing with our team at our St. James brewery in the next couple of weeks. We have been co-sponsors of the True/False Film Fest the last two years and are doing so again this year. The fest this year takes place at the end of February/early March so we plan to release that beer during the fest. Last year they brewed a stout and we brewed a pale ale that was designed to be poured together like a Black and Tan. Those turned out really nice. This year the plan is to make two beers and blend them prior to packaging. The plan is to brew a fruit beer made with cherries as well as a sour beer. The blended result should be a nicely balanced dark sour with cherry. We are talking with a couple of other folks in STL about collabs this year and I expect those will happen. We were pretty heavily involved in STLCBW last year and plan to do so again this year. Last year we brewed collabs with Friendship Brewing in Wentzville and Earthbound Beer on Cherokee that were released during STLCBW. It was a blast and we’re talking to some of our other brewing friends in STL about doing something this year. More to come on that. We also love the idea of non-brewery collabs with food producers or other businesses that share our values or can offer something unique to the collaboration and I wouldn’t be surprised if you see something like that from us this year too. We’re looking at our existing beers in new ways and plan to have some fun with changing those up and throwing some draft only variants of existing beers out there. It’s a fun way to get quick feedback and make customers part of our ongoing R&D process. You never know what people will embrace. People all over the country are taking notice of the STL beer scene for all the right reasons. I love the fact that not only do we have a ton of breweries making really good beer here, but with a lot of beer diversity too. That excites me. I love seeing the different approaches that all of our brewing friends are taking. I love that you don’t see a lot of breweries doing similar things. Everyone seems to have a niche and that’s what makes the beer scene so rich here. I expect to see more of that. And it’s fun to see some of the breweries who started up the same time we did (2010/2011) really cementing their brands and building sustainable businesses that craft drinkers will benefit from for a long time to come. We are always doing mini-fests/events/live concerts in St. James. Our biggest event of the year is our Oktoberfest which takes place at the Rolla brewpub. That’s always on the last Saturday in September. It’s becoming a tougher day to pull breweries together for the beer fest because we’re all being pulled in a million directions that time of year, but we always have 20-25 Missouri breweries there to pour and you see nothing but smiles on people’s faces that day and that makes it all worth the planning. Is there anything about 2019 that you can tell us that we have not asked you about? We are working on some CAN releases for the first time ever. We’ve been 100% bottled package since we began distributing beer in 2015, but that’s likely to change this year. There are a lot of reasons it makes sense for us, but one big thing we’re hoping to gain with cans is flexibility in terms of getting new beers to customers faster than we can with bottles. We’re still discussing which beers will go into cans and when, but Public House drinkers should expect to see some cans this year.